Wow, am I delinquent on my posting lately. So, let’s just pretend that didn’t happen and focus on the food! I’ve had a crazy last month or so, partly due to a wonderful two-week visit from my parents. I made this Barefoot Contessa baked shrimp scampi for dinner soon after they arrived, and along with my aunt and uncle, we gobbled up the whole thing. Yes, the WHOLE thing. The shrimp was buttery and sweet, with a wonderful kick from the shallots and garlic and great crunch from the panko bread crumbs. I served this with a salad and yummy fresh bread — it was perfect, and is definitely a “make-again” in my book. Shrimp is one of my favorite seafoods, but they can overcooked easily, and end up tough. One of the reasons this dish is so awesome is the shrimp are cooked *just* to the right point where they are tender and sweet and practically melt in your mouth. Squeeze some lemon over it when you serve, and that kick of acid is the perfect finisher. I recommend this for when you have company — it’s an impressive dish but really easy to prep and takes next to no time to cook, so you’re not torn away from the action for long. Bon appetit! 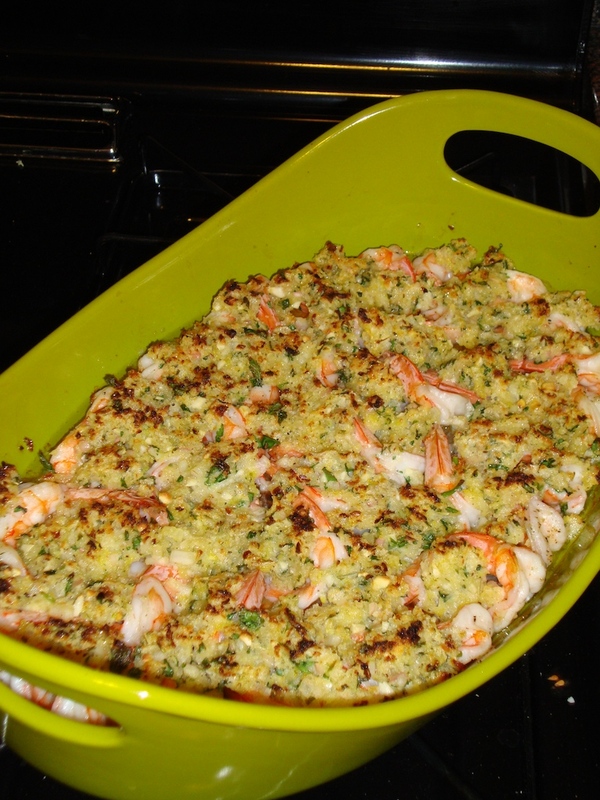 This entry was posted in Recipes and tagged Barefoot Contessa, scampi, seafood, shrimp by Tricia. Bookmark the permalink. This looks so good! I could almost taste it! Thanks, Jim! It was delish. It was definitely sooo good!! This was so tasty! Lots of flavores, quick & easy. Most of us all have these ingredients in the house already. Lemons, shallots, garlic, cutter, white wine, res pepper, Panko bread crumbs. Well I do. 🙂 I served with a nice basmati rice & salad with of course a good Chardonnay! Definilty the type of meal to serve at a dinner party. Thanks, Erica! So glad you liked it.